Today we feature picture book author Peter Pearson, noted expert on the etiquette of eating an airplane. 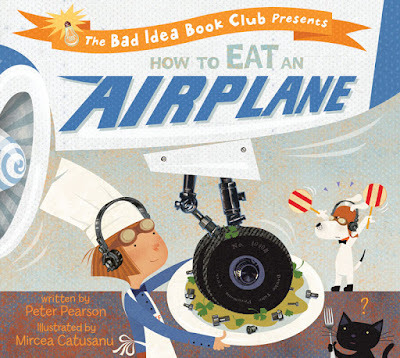 Be sure to enter to win a copy of his debut, HOW TO EAT AN AIRPLANE! Congrats on your debut, HOW TO EAT AN AIRPLANE! May we ask why you didn't start with something more manageable, such as a blimp or hot air balloon? Ah, the ol’ blimps-and-hot-air-balloons question. I thought about that, but the visual metaphor of something bright and magnificent deflating after a few swift bites was too much to bear. Okay, okay. The real story is that one day I sat down, stared into space, and wrote the line “If you want to eat an airplane, the most important thing is to mind your manners.” I had no idea what would come next, but it seemed strange and funny and interesting in just the right way, so I kept writing to find out what the story was. I wasn’t an architect building a skyscraper—I was an archaeologist on a dig, brushing away dirt to see if I’d found a pebble or a pyramid. Or maybe a picture book. What research did you undertake to write this book? My first scrap of research came when I was eight years old and found out that a real, live person had once eaten an entire Cessna 150 airplane (which I didn’t remember until halfway through my own book, ironically). 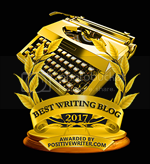 During the actual writing, I looked up a bunch of information about etiquette, but most of my research was focused on airplanes, which included interviewing a commercial airline pilot and an aerospace engineer. Also, I placed my teeth on the wing of a plane, just to see what it would feel like. I did not chew. When I think of long roads to publication, I think of Kate DiCamillo’s 450 rejection letters, so I’d have to say that my path was somewhere in between. I attended my first SCBWI conference in 2006 and felt completely overwhelmed, but I stuck with it, joined some writing groups, attended more conferences and readings, and finally enrolled in Hamline University’s MFA in Writing for Children and Young Adults in 2010, which was one of the best decisions of my entire life. Truly. I wrote the first draft of this manuscript during my third semester, met my editor there, and signed the contract in 2013. Ten years after first dipping my toe in, I finally have a book coming out. Which, you know, is awesome. I’m currently wrangling the next book in the Bad Idea Book Club, along with a middle-grade novel that’s been simmering for six years or so, which I hope will be tasty and delicious instead of burned and gross. You can never quite tell. Publishing a book doesn’t make you a writer, it just makes you a published writer. Read. Lots. And not just the kind of thing you write—everything. The only essential thing for the writing life is tenacity. Everything else is negotiable. Sometimes writing is really, really hard, but as long as you don’t quit forever, you’re good. I used to write under a pen name, but I’ve finally decided to come out of the shadows. Ha! Where can we find you online? After detours through social services and astrophysics, Peter Pearson earned his MFA in Writing for Children and Young Adults from Hamline University in 2012. 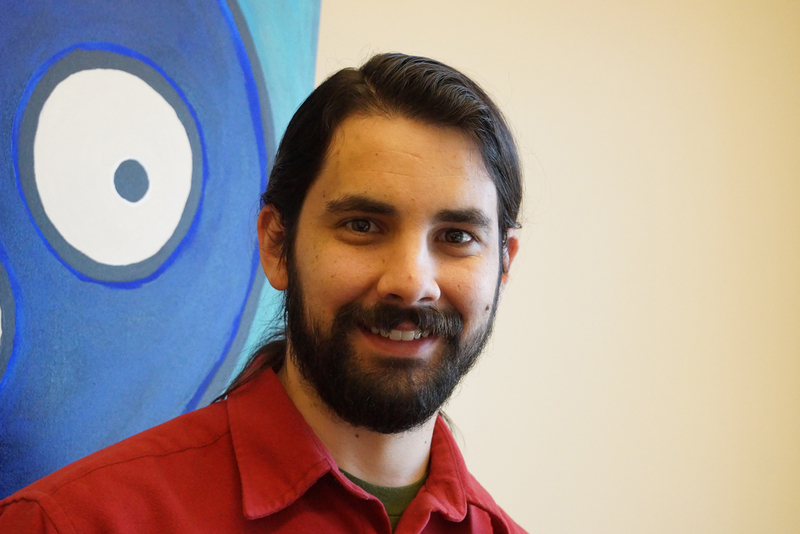 Peter has received awards, grants, and other recognition from Hamline, the Loft Literary Center, the Minnesota State Arts Board, and the Anderson Center. His first picture book, How to Eat an Airplane, was just released from Katherine Tegen Books/HarperCollins. He also makes pretty good pancakes and is sort of tall. What a genius idea for a PB--hope you sell a hangar full! Best of luck with your next books! I'm looking forward to book #2 and haven't yet read the first! Awesome. I loved the interview too. Oh yes - Michel Lotito ate a Cessna and 18 bicycles, 7 televisions and 6 chandeliers, among other weird things. Plus lots of mineral oil. Whew! Hip hip hooray for tenacity! This book sounds great and loved the interview. Thanks for the inspiration! Great interview! I really want to read this book. It looks so cute and fun. 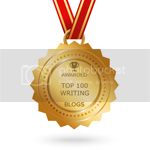 "The only essential thing for the writing life is tenacity. Everything else is negotiable. Sometimes writing is really, really hard, but as long as you don’t quit forever, you're good." Too much fun! Thanks so much for the advice - definitely wanna get my hands on this book too! Clever. Your picture book idea is so very clever! Great post and great advice.